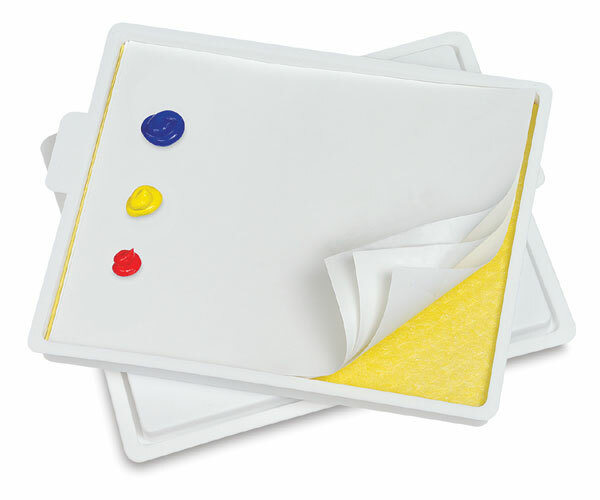 The Masterson Sta-Wet Handy Palette saves you paint, money, and time by preserving the freshness of acrylics and other waterbased paints, both while you are painting and between painting sessions. Paints will stay moist on the open palette for hours. Once the lid is closed, the paints will stay in workable condition for days, even weeks. Made in the USA of tough yet lightweight plastic, the Masterson Sta-Wet Handy Palette measures 1"H × 8½"W × 7"D (2.5 cm × 21.3 cm × 17.5 cm) — the perfect size for small projects or the classroom. The Handy Palette comes with five Sta-Wet palette paper sheets and one sponge insert. Replacement sheets and sponge inserts are also sold separately.